The FPGA based DSP accelerator products provide an ideal platform to rapidly field application specific signal acquisition and generation functions minus the expense of custom hardware development. Several products share a common FPGA processing architecture and code base with a variety of analog-to-digital and digital-to-analog converter options. The products are available in multiple form factors for seamless integration into an embedded chassis or traditional server/desktop environment. 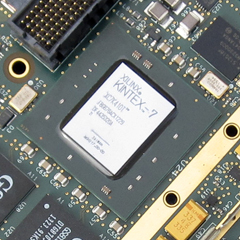 The embedded solution also conforms to the VITA conduction cooled XMC (CCXMC) specification. The CCXMC product can plug into any compliant host platform with no modification to the conduction frame. Prior generations of FPGA based DSP accelerator products are not listed here, but documentation and code can still be downloaded using the main menu above.